Zelda and Mario in One Nintendo Download? Is It Our Birthday? After several weeks of completely forgettable downloadable game offerings, Nintendo drops a free Zelda game, a Super Mario sequel, and a particularly intriguing WiiWare title, all at once. I might faint! Technically the free Legend of Zelda: Four Swords Anniversary Edition dropped yesterday, but I'm feeling charitable today, so we'll accept its inclusion in the weekly Nintendo Download list. Besides, it looks really good next to Super Mario Land 2: 6 Golden Coins, so we'll keep it. 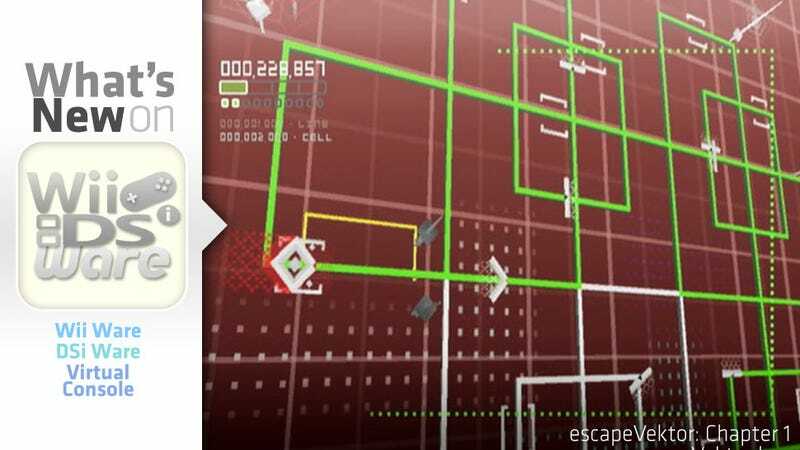 Along with the two heavy hitters we've also got Nnooo's escapeVektor: Chapter 1, a stylish arcade adventure that smacks of the better bits of Tron. Be sure to hit up the game's Nintendo page to check out its gameplay vids. It looks pretty spectacular. Normally I'd lead up to the full list with some disparaging remarks, but this week I've got nothing. Nice job, Nintendo! Help Vektor escape the clutches of the evil CPU & its army of Patrols, Hunters and Interceptors. Vektor has been locked inside your Central Processing Unit. He is not sure how he got there or how long he has been there but he needs your help to escape. The CPU has disabled Vektor's ability to move around independently but he is an expert coder. Work with Vektor to help him escape the evil clutches of the CPU. Direct him through the CPU's labyrinth, avoiding enemy Patrols, Hunters and Interceptors. You must move fast as the CPU can adapt quickly to your escape. Vektor will code new abilities for you to combat the increasing power of the CPU, but his fate lies in your hands. Temper-tantrum tyrant seizes Mario Land! In his greatest Game Boy adventure, Mario faces off against his evil rival Wario, who has captured Mario Land and turned it into his private playground. To toss Wario off his ill-gotten throne, Mario must search new worlds for the six golden coins that unlock the gate to Mario's castle. A mob of monsters, old and new, seek to stop him. Along the way, through six zones, Mario can nab Power Mushrooms, Super Stars and Fire Flowers for extra power. And if he eats the Magic Carrot, he'll turn into a high-flying hare! It's free! You do not need a description. Just get it. nlock the riches of the legendary Crystal Caverns of Amon-Ra by capturing the crystal spheres before they reach the Pit of Fire! Blast through over 1000 action-packed levels in 10 dazzling worlds filled with twists and turns, winding caverns and crystal sphere teleports. Catch magic hieroglyphs sent by Amon-Ra to help you in your quest, including Laser, Bomb, Paint, Reverse and more. Test your strategy and skills with 3 game modes and tons of explosive action! Crystal Caverns features classic gameplay enhanced by easy-to-use controls and lots of surprises. With 3 different game modes, 10 amazing worlds to discover and 14 special power-ups, it's the perfect combination of action and puzzle fun! Bugs'N'Balls is the most played game in the Bug's World. Our goal is to play against all the opponents from the Cucumber League and win the maximum number of matches to gain access to the professional league. Bugs'N'Balls is very easy to play. Throw the balls in your side of the table into your adversary's. Dodge the balls from your opponent or you'll get knocked out for a while. With luck we can become champions of the professional league. But it's not that easy… we'll need to train hard.